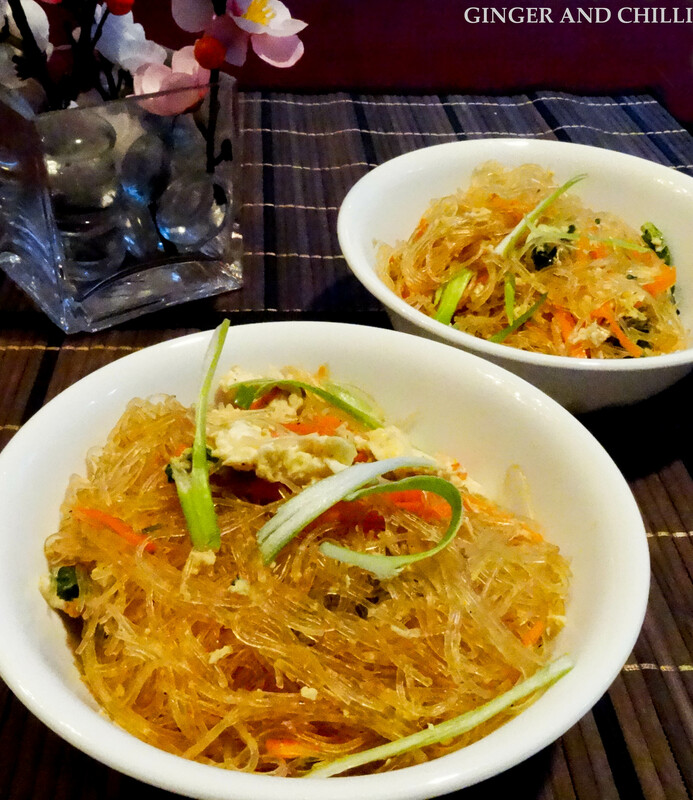 Tang hoon, also called vermicelli, glass noodles, 冬粉 (dong fen, meaning winter noodles), is a light version of bee hoon, typically made from some kind of starch. Most commonly found are ones made of mung bean starch, often referred to as ‘mung bean thread’. Compared to bee hoon, which is made of rice, tang hoon is finer and more delicate. Further, it looks glassy and transparent when cooked, hence the name ‘glass noodles. Tang hoon is tasteless on its own, making it a versatile addition to many dishes. It can be used to add textural interest to soup or gravy, as a side dish when stir-fried, or as in this recipe, as a meal by itself. Common ingredients for stir-fries include some combination of chicken, fried or dried shrimp, shiitake mushrooms, fish cake and bean sprouts. It is merely a matter of preference, variety and choice. I added a hefty dose of pepper in my version; go easy if you do not care for it as much. 1. Heat 2 tbsp oil in wok. Add garlic and shallots. Stir-fry till golden. 2. Add carrots. Fry till nearly cooked through. 4. Add tang hoon and sauce. Stir to combine well. Lower heat to medium. 5. When liquid is mostly absorbed, add eggs to side of wok and leave untouched till eggs are half-cooked. Break up egg and mix into tang hoon till eggs are cooked through. 6. Garnish with green onions. Serve with dollop of belachan. These pale-fleshed, spongy gourds are commonly eaten during winter. Low in calories, it has a mild and refreshing taste. A week ago, the Asian supermarket was selling 2-lb slices at incredibly reasonable prices, despite being an unusual crop for this time of year. I was recovering from a bout of ‘heatiness'(阳 yang); this ‘cooling'(阴 yin) gourd in a clear soup was just the ticket. Nonetheless, I added a bit of ginger(阳) into the soup to balance the yin(阳). The seeds, which can be candied, and often eaten during Chinese New Year, are easily scooped out with a spoon before cooking. This is a versatile plant; nearly every part can be eaten except for the skin and roots. 1. Blanch pork bones to remove foam and rinse quickly. 2. Place pork and chicken bones in 6 cups of water. Bring to a boil for 10 minutes. 3. Add carrots, celery, scallop, ginger and shallot. 4. Boil for about 20 minutes. 5. Add winter melon and cook till transparent. 6. Garnish with ham and cilantro to serve. Mid-Autumn Festival Mooncakes 中秋月饼, commonly just called ‘Mooncakes’月饼 are traditionally eaten during the Mid-Autumn Festival. Shared with friends and family while celebrating the abundance of harvest, the Mid-Autumn Festival is one of the four most important Chinese festivals and falls on the 15th day of the 8th lunar month in the lunar calendar. These round-shaped cakes symbolise unity and harmony, although modern day mooncakes come in a variety of shapes. Stories abound regarding the origin of the mooncake. The account I grew up with tells of notes hidden in the sweet cakes that Han Chinese rebels, led by General Zhu Yuan Zhang 朱元璋, used to coordinate against the Mongols. The rebellion ended the Yuan Dynasty in 1368. Mooncake moulds come in wooden and plastic versions. Wooden moulds must first be ‘seasoned’ by air-drying well to ensure there is no moisture trapped in the wood, then soaking completely in oil for 1-2 days and air-dried again. Peanut oil is traditionally preferred but I suppose other types of vegetable oils could be substituted. Thereafter, the mould should not be washed or rinsed in water. After experimenting with proportions and ingredients, this recipe is what I will be using for a while. It makes about 8 regular-sized mooncakes, 3″ (8cm) in diameter. 1. In a large bowl, add golden syrup, alkaline water, olive oil and vanilla extract. Stir till well combined. 2. Add in sifted flour and mix to just form a soft dough. Do not over knead. 3. Wrap dough with cling wrap and leave to rest for 30 min, but about ideally 2 hours 醒面. This helps the dough harden slightly and become more elastic, making it easier to work with. After waiting, lightly knead to smoothen it. 4. Divide dough into 35g pieces and shape into balls. 1. Divide the filling paste into 60g pieces. Optional: Add 1-2 tsp of melon seeds or pine nuts to each piece. Shape filling pieces into a ball. 2. If making filling with salted egg yolk, adjust weight paste so that the total weight of the yolk and paste is 60g. Wrap filling paste around the yolk and shape into a ball. 3. Make the same number of filling pieces as there are dough pieces. 1. Roll the dough over some flour. Dust rolling pin with flour. Flatten each dough into a small disc. 2. Place a piece of filling within a disc of dough (skin) and wrap, forming a smooth ball. 3. Lightly dust the wrapped mooncake ball with some flour. Place it in the mooncake mould and press firmly. Invert the mould and tap a few times to eject the mooncake. 4. Place mooncake on a floured baking tray lined with parchment paper. 5. Repeat until all the dough is used up. 6. Spray some water on the mooncakes. 7. Preheat oven to 350°F (180°C). Bake for 10 mins. 8. Remove from oven and leave to cool for 20 minutes. 9. Brush the mooncake evenly with egg wash, including the sides. Remove any bubbles that might have formed during the brushing process. Bubbles tend to ruin the appearance of the final product. 10. Return to oven and continue to bake for another 10 to 12 minutes, or until golden brown. 11. Leave the mooncake to cool completely. Wrap in parchment paper and store in air tight containers. Allow 1-2 days for the oil to seep back out 回油, resulting in a softer and shiner skin. We needed a quick dinner tonight, for today we are watching “Sunday in the Park with George” by Stephen Sondheim and we have 2 hours to get to the theatre. A peek into the fridge and I came up with this steamed tofu dish served over steaming rice. Finely chop 1/2 of the green onions. Thinly slice the other half and reserve for garnishing. Add chopped green onions, water chestnuts, salted egg to minced turkey. Roughly combine with a few stirs. Add cornstarch, sesame oil, a dash of salt and pepper. Mix well. Cut tofu into 8 cubes. 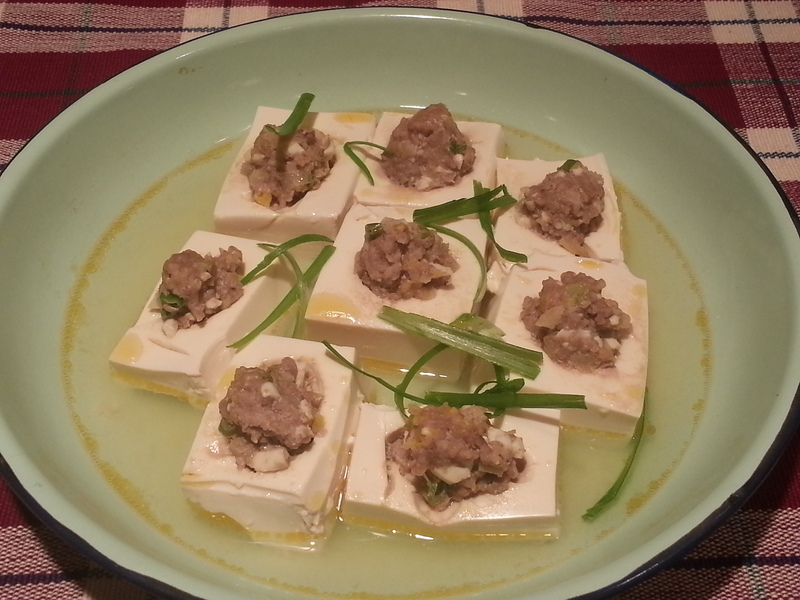 Scoop out a teaspoon from the centers, creating a well in each cube of tofu. Fill the wells with turkey mixture. Drizzle 1 tbsp soy sauce/1 tsp oil mixture over tofu before serving. Easy weekday dinner with minimal clean up! Can also be served as an easy appetizer. 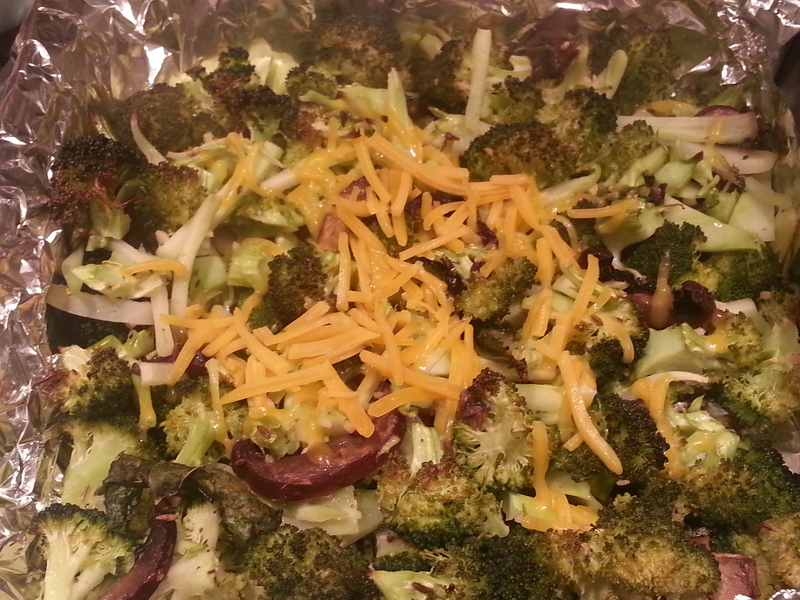 Toss broccoli and mushrooms with olive oil, salt, cumin seeds in a large bowl. Bake for 20 minutes in 425F, less for crunchier florets. It is a cool evening, heralding the beginning of fall with the leaves rewarding with sights of yellow and orange and red everywhere we turn. Cool weather needs foods that bring comfort. In this all-in-one dinner recipe that was made with available ingredients in the fridge, ginger is added for its warming effect. For the noodles, any white wheat noodles will do. I prefer Hsin Tung Yang’s guan miao noodles. Marinate chicken for 10 minutes. Coat well with flour. Set aside. Heat oil and sauté garlic, shallots and ginger till fragrant. Add chicken and stir quickly , turning over cubes evenly. 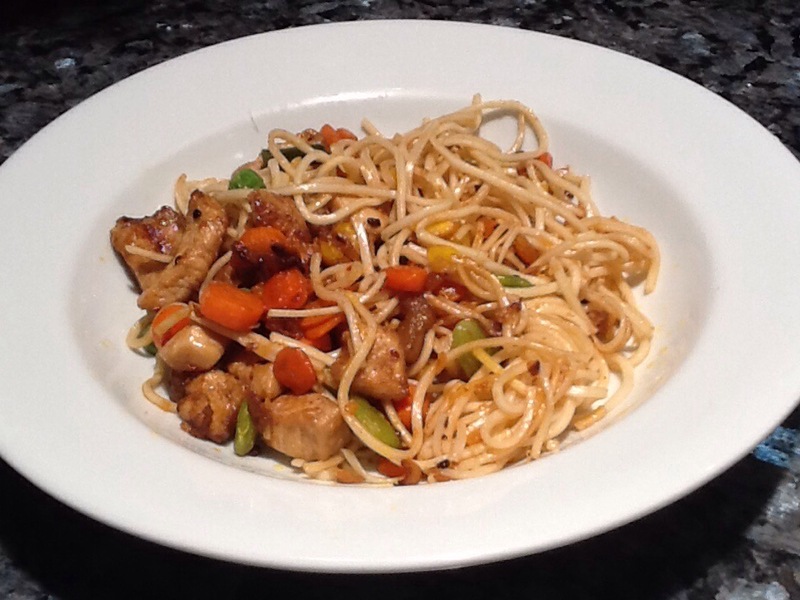 When chicken is nearly cooked, add carrots and sauté well. Add cooked noodles. Avoid adding the liquid from the noodles to the wok. Add a dash of soy sauce to taste if needed. Lately, I am experimenting with pork fat. I sneaked in a couple of pieces along with the ginger, shallots and ginger. 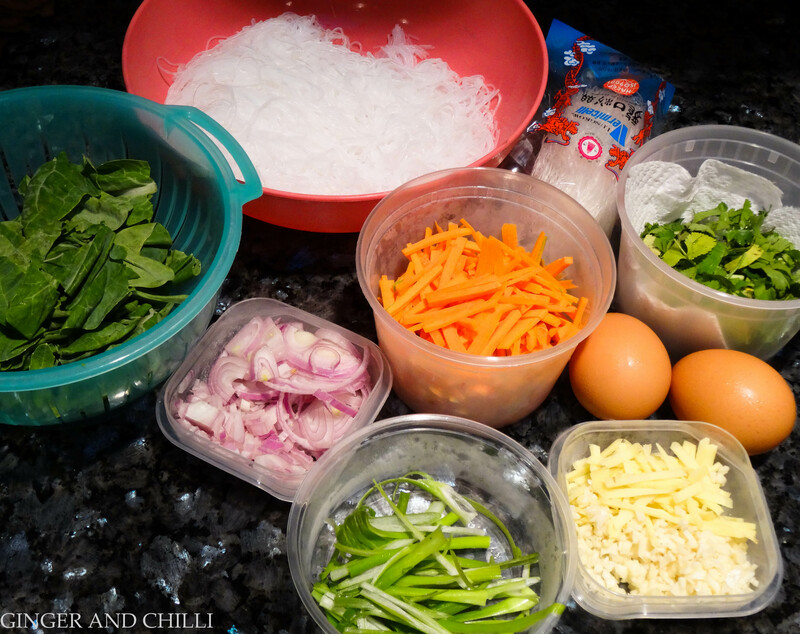 After adding the noodles, I felt we needed more veggies since I had not prepared a separate dish of vegetables. So I added a handful of frozen mixed vegetables that I had on hand. At the last minute, I spied my bottle of hay bee hiam (Nonya fried shrimp) which my family loves on a cool evening, and added a tbsp of that toward the end of the cooking as well. These patties are easy to make and keep well for a week in the fridge. Plum, ripe tomatoes add a shot of sweetness and juiciness to the otherwise dry patties. Turkey or chicken can be used to replace red meat; adjust seasoning to make up for the milder taste. Place the meat in a bowl stir in turmeric. Pound (or use a food processor) to combine the lemongrass, garlic, shallots, ginger, and salt into a rough paste. Add tomatoes and pound to mix well. Add the paste to the meat and mix ingredients well. Shape the mixture into 1″ balls, flattening gently to form patties. Add patties into heated oil on medium-high heat. Fry for 1 – 2 minutes in each side till golden. Tip: Keep ingredients mostly dry before mixing and pounding to prevent patties from being too wet during frying. If it does happen, increase heat to allow liquid to evaporate during frying.